JPH & Associates, Inc. is pleased to announce the award of $1.2 million in pre-development demonstration grants to three nonprofit organizations who develop affordable housing for seniors. Recipients of this August 2012 funding announcement include the Diocese of St. Petersburg, Archdiocese of Miami, and Presbyterian Retirement Communities. These funds will be used by the Sponsors to off-site costs and expenses incurred prior to the start of construction on their respective senior housing developments. In 1996, Abilities of Florida received HUD Section 811 funding to purchase and renovate six condominium units in the Morningside Condominium complex in Clearwater. Sixteen years later, Abilities received an additional $1.08 million in Section 811 funding, plus an additional $200,000 from Pinellas County to acquire and renovate an additional eight units. In August of 2012, JPH & Associates, Inc. announced the completion of phase two. The newly renovated units are some of the first in the State of Florida that have received the Florida Green Building Coalition. This designation impacted apartment features including, but not limited to air conditioning/heating, appliances, water conservation features, low emission paints, and the incorporation of recycled materials throughout. The end result is a more efficient and intelligent design, plus significant reductions in future operating costs, which will directly benefit those tenants who are physically disabled and who have household incomes as defined as “very low and extremely low”. JPH & Associates, Inc. announces completion of the second phase of Glen East II on July 13, 2012. This second and last phase complements the highly successful first phase, which was completed rented within 60 days of opening. In Phase II, HUD provided an additional $4 million in financing to construct 37 one bedroom units situated in 16 buildings. The entire site is linked with an extensive walk-way system and has on-site covered public transit stops. 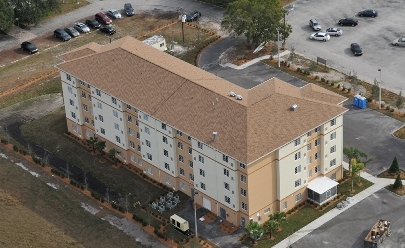 This phase, as was the case with the first phase was co-sponsored by Wiregrass Foundation and B’nai B’rith Housing, Inc.
JPH & Associates, Inc. served as Owner’s Representative on the recently completed Patrician Arms II project completed by the Diocese of St. Petersburg and Catholic Charities of St. Petersburg. As an Owner Representative, JPH & Associates, Inc coordinated all aspects of the project from the grant application process up through initial occupancy. This 68 unit, $8.7 million dollar project is rent and income restricted. Residents must be senior citizens. The project was financed by the US Department of HUD. The project is the second phase of a two phase project and is located adjacent to St. Patricks Catholic Church. Unique design and construction elements include a plethora of energy saving features, a back-up generator which will power all common areas and one elevator in the event of a power interruption, solid surface kitchen counter tops, use of tile throughout, electric elevators, and fully accessible units. Catholic Charities will be the management agent and based on the current wait list anticipates full occupancy within weeks of opening. JPH & Associates, Inc. served as Owner’s Representative on the recently completed St. Joseph Garden Court project completed by Catholic Charities in St. Cloud Florida. As an Owner Representative, JPH & Associates, Inc coordinated all aspects of the project from the grant application process up through initial occupancy. This 50 unit, $5.6 million dollar project is rent and income restricted. Residents must be senior citizens. The project was financed with Neighborhood Stabilization Program (NSP) funds administered through the Florida Department of Community Affairs and Osceola County. It should be noted that this is the largest NSP project funded to date within the State of Florida. The project consists of multiple one-story buildings housing one and two bedroom units. The project also utilizes existing two story town home units, each having three bedrooms. Initial interest has been high and full occupancy is expected within the 30 to 45 day of the Certificate of Occupancy. 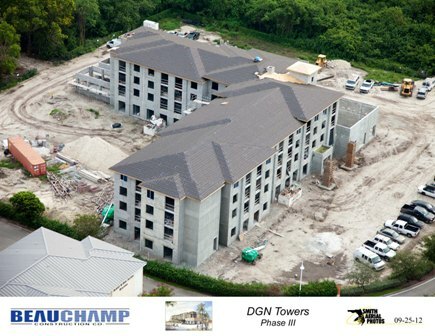 DGN Towers III, a project sponsored by Miami Jewish Home and Health Services is approximately 60 percent complete. This 75 unit, $10.6 million project for the elderly is the third phase of a three phase effort that commenced over eight years ago. The land was leased to the Sponsor by the State of Florida at no cost. These cost savings on the land were returned to the project in a series of construction upgrades. The project will be one of the first HUD 202 projects within the State to earn an energy LEEDS certification. This certification incorporates energy saving design/devices into the project while encouraging the use of green features such as low emission paint and recycled materials. Completion is expected in February of 2013.